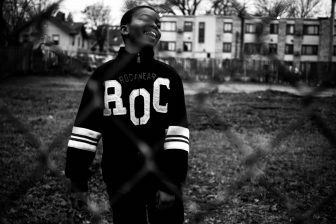 Documentary photographs featured in “In the Company of Others” give us a glimpse into a few corners of the life and crossroads of a “young, gifted and black” artist from Minneapolis. A solo exhibition by Den-Zell Gilliard, the production coincides with the celebration of African American History Month and fosters dialogue toward understanding and equity. In this exhibition, Gilliard presents selections from three series: Sunday’s Best, highlighting portraits of parishioners, Sunday services, and church leaders in several African American churches in south Minneapolis; Odyssey of a Black Boy, featuring photographs of urban black youth and families in action outdoors; and various self-portraits of the flamboyant, often vicarious, and generally enthusiastic character of the artist. Viewed comprehensively, these three series are simply about life in an African American community in all its beauty and poignancy, and more complexly about the models available and the life choices that the artist knows he must make. The Jan. 28 exhibition opening, Feb. 7 gallery reception, and accompanying special events are free and open to the public. Gilliard is not formally trained as an artist, but has been mentored by local photographers Wing Young Huie and Inna Valin. He is a recent recipient of a Block Grant for photography in south Minneapolis and is out with his cameras daily. Perhaps the greatest stylistic influence of Gilliard’s practice is Gordon Parks, the celebrated 20th century documentary photographer and the gallery’s namesake. “In the Company of Others” opens Monday, Jan. 28 and runs through Feb. 21. A gallery reception will be hosted Thursday, Feb. 7 from 6 to 8 p.m. with a gallery talk by the artist at 7:30 p.m. Gallery hours during the week are 11 a.m. to 7 p.m., Monday through Thursday. The gallery is located at Metropolitan State University’s Saint Paul Campus on the third floor of the Library and Learning Center, 645 East Seventh Street. I would to see the exhibit. Are there weekend gallery hours? This is my first introduction to him.